Bringing babies and pre-schoolers to church can be stressful but we love to have children of all ages at St Wilfrid's! The Sunday Service - starts at 10am but if you arrive 10 minutes before the service you will have time for hanging up coats on the hooks in the church hall, last minute trips to the toilet, finding seats in the church where the children can see etc. There is an area up in the Lady Chapel reserved for under 5’s (and their siblings). There is supposed to be a quiet reflective time (!) before the procession comes in at 10.00. There is often a simple hymn or chant called The Gathering at this time. There are some prayer ideas on laminated cards around the church. Follow the service in the Red Book found behind each seat unless you are given a sheet at the door for special holy day services like Christmas and Easter. School age children sit with their parents for the first hymn. 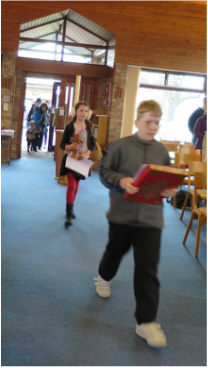 After this, during the Gloria, they are led out by one of the children carrying the red bible and the wooden cross to Junior Church in the Church Hall. 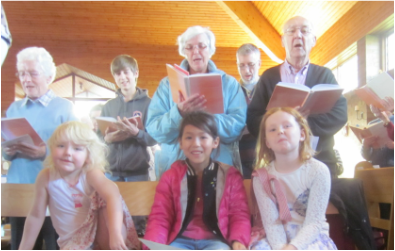 Jubilate Service – On the first Sunday of each month the children join in for the whole main 10.00am service. The music is a bit more upbeat and the sermon aimed at the children. Taize Service – Held fortnightly Sundays 8.20am in St Wilfrid’s Church Hall and St Paul’s Church Hall alternately. (See noticeboard outside hall for dates) Short service with bacon butty breakfast at 9.00. Good practice for the main Sunday service with a more relaxed feel and lots of smaller children. It still feels a bit uncomfortable when they are very noisy but it’s mostly families so it may not be so nerve-wracking. Join the bacon rota for networking opportunity. Evening Service - Mainly, but not exclusively, used by adults. Perhaps you could leave the kids at home and get some precious quiet time for your own reflection. ...either sleep through happily, sit quietly or your lap or scream endlessly (may need removing from the building at times) The Play Room is a carpeted room at the back of the church hall useful for letting babies crawl about. There are some toys provided (please put them away at the end). Please consider donating toys in good condition when you have a throw out session. A Crèche is sometimes run in here as and when there are enough babies to make it worthwhile setting up a rota. Please speak up if you would like help organising this. 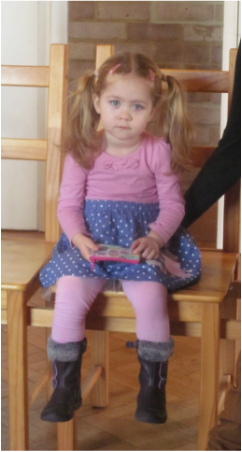 ...toddle – all around the Church, beaming at pensioners and fire extinguishers and scream when restricted. Follow them around as long as you can stand to, ply them with toys, books drinks, snacks. Feel free to leave the service for a little while if your child (or you!) needs a break. The Lady Chapel is set aside particularly for tiny children. They can look through the glass balcony to see what is going on but it’s near the back so you can escape discreetly if necessary! ...play with toys, can clap, sing, hold a hymn book (either way up) can sit on their own little chair (provided) and can line up for a blessing. Can join in with Sunday School with a parent. ...can join in with Junior Church in the hall or sit in church with you. Set an expectation for school age children that you expect them to sit quietly on a chair during the ‘kids in’ part of the service. If you come regularly they tend to cope better as they get used to it. Try to engage the children with what’s happening eg notice any changes to the colours of the robes the priest is wearing, any special candles (eg advent), maybe the picture of St Wilfrid has been covered up (lent) or there are special flowers (after a wedding). Readers can read the service sheet and hymns with you. There are some children’s service books with colourful pictures and simple explanations of what is happening. These are kept on the shelves by the door. Cajole, coach or bribe children (usual parenting techniques) to get them through the last few minutes. You are encouraged to have the children sitting with you in the service rather than with their school friends as the noise levels tend to rise when they congregate; one of the incentives for sitting quietly could be the chance to stay and play with their friends after the service. Children from Year 6 up are invited to join in with youth group activities. Peace - Teach your child to shake hands with people they know and later, as their confidence grows, with people they don’t know. 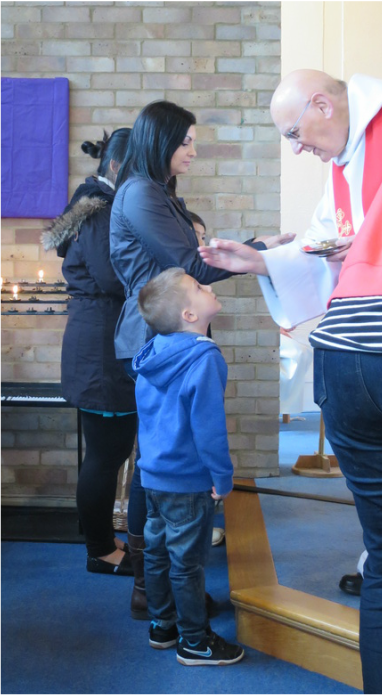 Communion or Blessing - If you have been confirmed, come up for communion. If not, come up for a blessing (bow your head so the priest knows to give you a blessing). Teach your children to say ‘Amen’ when they have received a blessing. Foodbank/Stonepillow Box - Bring a contribution of food or toiletries for St Joseph’s refuge for the homeless. There is a box by the front door. Children may understand the gift of food better than the idea of giving money to charity. Coffee in the Hall - Join everyone in the Church Hall, buy a ticket for the bonus ball draw, chat, catch up, negotiate with your kids over how many biscuits they are allowed. Congratulate yourself on surviving another week! !